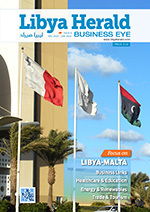 Libya Herald Business Eye is a 40-page magazine covering news and developments in Libya. Written and published in Libya – each issue features interviews, sector updates and business news. If you are interested in regularly receiving printed copies of the Libya Herald Business Eye please click here for an order form. 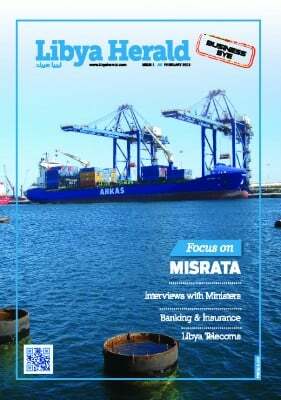 April / May 2014 The eighth issue of the Libya Herald Business Eye is now available to online subscribers as a pdf download. This 40-page magazine includes a focus section on construction in Libya. With exclusive interviews with the Chairman of the Railways Board reviewing LRT/metro and rail projects, the Libya 2017 Committee preparing for the 2017 Africa Cup, and Managing Director of Libya Build – this section highlights projects underway and planned. Economic, trade and investment news includes an interview with the Head of Reserves at the Central Bank of and an update on Indian-Libyan commercial ties. As well as business and investment news, this issue also includes articles on developments in the energy sector, training and tourism and… and plenty more. February / March 2014 The seventh issue of the Libya Herald Business Eye is now available as a pdf download. This 40-page magazine includes a focus section on education and training in Libya. With exclusive interviews with the Minister of Education and the General Manager of the Warriors Affairs Commission – this section considers Libya’s education needs and challenges, and the contribution being made by local and international training providers. As well as business and investment news, this issue also includes articles on Libya’s plans for economic diversification, developments in the energy, transport and telecoms sectors… and plenty more. If you would like to order the print version (minimum 10 copies) please click here for order form. 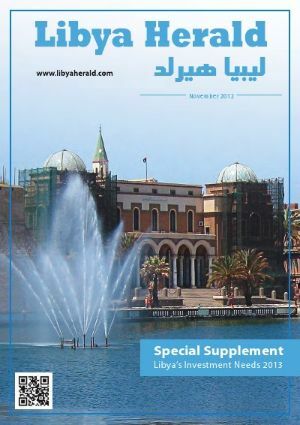 December 2013 / January 2014 The sixth issue of the Libya Herald Business Eye is now available as a pdf download. This 40-page magazine includes a focus section on business links between Libya and Malta. Interviews with Maltese organisations and companies working with Libya highlight developments in the areas of training, healthcare, oil services and hospitality. This issue also includes articles on the Libyan economy, plans for renewable energy, the promotion of non-oil exports and plenty more. October/November 2013 The fifth issue of the Libya Herald Business Eye is now available as a pdf download. This 40-page magazine focuses on the retail sector in Libya. 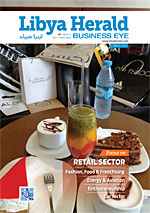 It includes interviews with leading fashion and food brands, and considers the legal aspects of franchising in Libya. There are also articles on the economy, entrepreneurship, energy, the car sector and plenty more. August/September 2013 The fourth issue of Libya Herald Business Eye is now available as a pdf download. 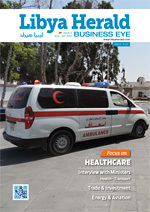 The 40-page magazine focuses on the healthcare sector in Libya. It includes interviews with the Minister of Health, Libyan and international healthcare providers. It also features interviews with the Minister of Transport and banking leaders, along with articles on finance, energy, construction, transport and plenty more. 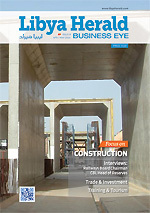 June/July 2013 The third issue of Libya Herald Business Eye is now available as a pdf download. 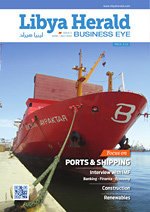 The 40-page magazine focuses on ports & shipping with interviews with the IMF and banking leaders. There are also articles on finance, economy, construction, oil & gas, telecoms, renewables and plenty more. 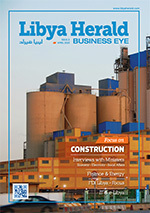 April 2013 The second issue of Libya Herald Business Eye is now available. The 44-page magazine focusses on construction in Libya but there are also interviews with the Ministers of Economy, Electricity and Social Affairs. There are articles on the oil and gas sector, banking, transport and the Tripoli International Fair among many other areas of interest. 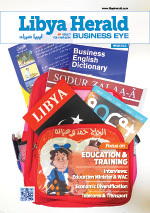 Issue 1 – February 2013 Welcome to the first issue of Libya Herald Business Eye – our regular business magazine on Libya. This 40-page issue has a focus on Misrata, interviews with the Ministers of Planning, Electricity and Transport, together with feature articles on Energy, Banking & Finance and plenty more! Libya’s Investment Needs 2013 November 2012 This Special Supplement (40 pages) examines Libya’s Investment Needs for 2013 across 15 sectors including; oil & gas; healthcare; power; banking; telecoms; and trade & investment.